Today's the day of a new Intel sim opening up. At exactly 9.a.m (18.00 C.E.T.) the sim will open up with a press conference. 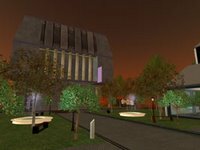 In april I reported that Intel geared up with several new sims being under construction, and before that I've blogged on the OCC and Live without Boundaries theme sims by Intel. First on the spot today were the gang from Things to Do., rallying at the New Business Horizon sim. Right after we went over to the Intel site, which was soon filled to the brim with 53 people. We were urged to find a seat, but many of us didn't dare move a hair with this visitor load. From the press comes a nice pun that Intel believes itself to be part of the "core of Second Life" and they see SL as "a wonderfull place to explore and engage" and so on. The sim is build by Millions of Us and will act as Intels new virtual HQ. 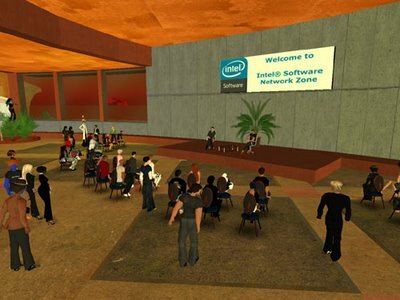 According to Intel's General Manager "Second Life is not the ultimate environment, but it's a start" Oh, yeah, they're still talking about getting the Developer community involved and "Help shape the future". I guess I'm not really a press conference type of guy, but it's very rude to slip away. Hope to get to do some networking in a bit.